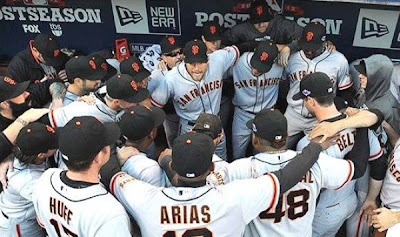 The Giants clinched the division a full two weeks before their first playoff game. It gave Bochy the chance to rest who he wanted, when he wanted, as well as line up the pitching. There was never a doubt that Matt Cain would be taking the ball to start the playoffs. After watching this team for 4 straight months I wasn't just happy to have the Giants in the playoffs, I thought they could win it all. There was a cohesion that I have talked about before with this bunch. Everyone knew their role. Back in 2010 when the Giants were heading to the playoffs they were sneaky good, this time around they came at you in all parts of the game. This season was the first without my father. It had ended with his Giants in first place, with a chance to make some noise. My dad was my coach for many years growing up. 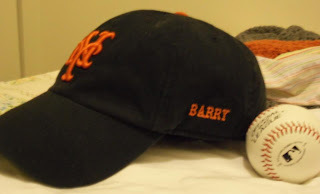 In fact, the youth league I played in growing up had MLB caps and jerseys. Every year but one that my father managed my team we were the Giants. The only year someone else got it was a guy that had been drafted by the Giants back in the day. I digress. My father grew up in New York, his roots lay deep with the Giants. He was only 3 when Bobby Thomson went deep at the Polo Grounds. He was 6 when Willie made "The Catch". The 2010 season was something special for him to behold. It was something he never thought he would see in his lifetime. Thankfully he did. The 2012 team was one my dad would have loved. It was a team built on fundamentals. In all the years growing up the little things he pointed out to me about winning baseball, were the things that this team was doing. There are things you think and you will never shake. The feeling that my dad's fingerprints were all over this team is one I will forever carry. Right down to they way the Giants just showed Melky the door after he was caught cheating. The values of baseball that he had taught me were right there on the field every night. I wouldn't call it irony, I don't know what I would call it. My dad would have loved this 2012 squad more than any other. I am sure of that. So what would happen in the playoffs? The Giants finished the season with a record of 94-78. They were the 3rd best team in the National League behind Washington and Cincinnati. This year's playoffs had a new twist. There were 2 Wild Card teams this time around. They would play a winner take all game to see who would play the Nationals, who had a 98-64 record, best in all of baseball. So the Giants were set to face the Reds in the best of 5 NLDS. Due to a scheduling quirk, the Giants would open with 2 at home and then 3 on the road. It seemed to be in their best interests. Sweep at home and then win just one on the road. I thought that's what would happen, the Giants had been playing that well. But baseball is a funny game, as the next month was about to teach us. It looked early on like everything was going to favor the Giants. The schedule was in their favor, the crowd was theirs, and Johnny Cueto could only make it through one batter in the 1st inning. The Reds ace had to be shut down before the series even began. 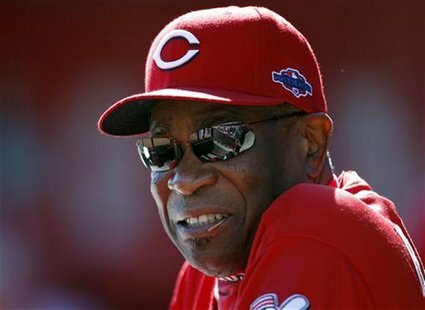 All of a sudden Dusty had to shift his pitchers and threw Sam LeCure out there. The Reds looked vulnerable and the Giants had cashed in on that all year. But it didn't happen that way. The Giants couldn't do anything. When it was time for a Starter to go a few innings for the Reds, Mat Latos stepped in for 4 IP. The only run he gave up was a solo shot to Buster. Meanwhile Matt Cain had to battle. He seemed to be fighting himself all night and gave up HR's to Brandon Phillips and Jay Bruce. The Horse just never found his groove. George Kontos came in with 2 innings of great work but the Giants Offense wasn't helping out. Santiago Casilla gave up 2 late runs and the Giants touched up Aroldis Chapman but the damage had been done. San Francisco missed a huge opportunity in Game 1. Things did not get better in Game 2. 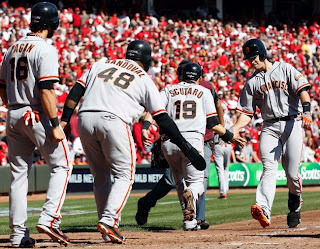 The Reds came out and blew the doors off Madison Bumgarner and the Giants. Bronson Arroyo looked untouchable, keeping hitters off balance all night. The Giants managed only 2 hits and no runs while giving up 9 runs. It was embarrassing. It was an utterly bad game, and not the team we had seen all year. The Reds got to go home and try to win one game in three to move on. The Giants would have to make history if they were to advance. Since I watched the games on computer I didn't use social media that much during games. Towards the end of the season I started getting more active with Giants fans on Twitter. I had never been in to Twitter for more than a way to read the writers I like. But I found watching games with my "Twitter Family" was a blast. During the first 2 games of this series I decided to stay off the computer completely. No Twitter during games. I wanted to just watch baseball. But we know how those first 2 games went. So it was for game 3 of this NLDS that I opened my computer back up and joined the party. It was great. There were new people every day to root along with. As we will see in the St. Louis series, Social Media had a lot to do with the fun of 2012. It was already do or die for the Giants. They were faced with the task of being the first team in NL history to come back and win 3 straight, on the road. In one swift act in the 1st inning, the ship seemed to get righted. Brandon Phillips led off with a single. On a passed ball he attempted to make it to 3rd, Buster had none of it. He calmly threw BP out for the first out of an inning at 3rd base. The Reds went on to score a run later in the 1st. It was the last run they would score all game. The Giants were held to one hit through 9 innings. In the 3rd Blanco was hit by a pitch, moved over on Crawford's walk, then took 3rd on Vogey's bunt, and scored on a Pagan Sac Fly. That was it. So they played the 10th. Buster led off with a single to RF. The kind of swing he has when you know he is seeing the ball. Pence followed that with a ball through to LF. On consecutive AB's, the Giants had more hits than the rest of the night. Belt and Nady then struck out. The Reds had a chance to get out of it. Then on a 1-2 pitch Joaquin Arias hit a slow chopper to third. Rolen charged but the ball came up off his chest and he had to gather it in. The throw to first was late and the Giants had their first lead of the series. Sergio Romo went 1-2-3 in the bottom half of the 10th and the Giants won. A hit by pitch, sac bunt, sac fly, and error, had the Giants back within one win of tying the series up. Game 4 resembled the regular season team more than any game had yet. Pagan led off with a HR to put the Giants out ahead. Barry Zito was then erratic in his half of the first and walked in a run. Zito had been left off the roster in 2010, this was his first chance to pitch in the postseason with the Giants. He was not up to it. Thankfully, the rest of the squad had his back. The Offense kept it going in the 2nd by scoring 2 on a HR by Blanco. 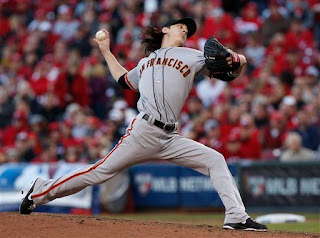 The story of the day however was Tim Lincecum. I love Tim Lincecum. I won't be shy about it. I use the number 55 for things, he's my man. But he just wasn't right this year. So Bochy did the tough thing and put Tim in the bullpen for the playoffs. 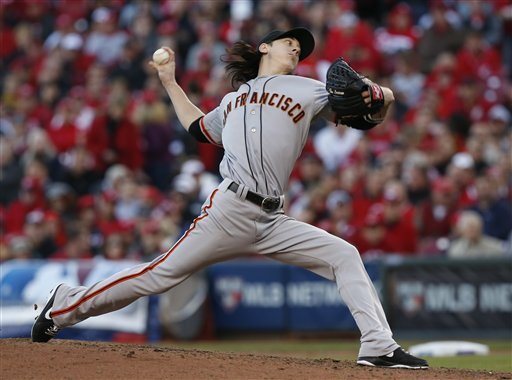 Lincecum accepted it, and then went out and dominated. He rescued Zito by throwing 4.1 innings and allowing 1 run. The old Lincecum was back getting a strikeout on 6 of the 13 outs he recorded. In the 7th inning Pablo jacked a home run and we were headed for a Game 5. The Giants finally looked, and played like the better team. Confidence in the Giants was back. I had wanted to write them off after the first 2 games. Karen talked me off the ledge. They proved her right in Games 3 and 4. During games I had my own ritual down by now. I would wear one of my dad's old shirts, keep the hat you saw above over my shoulder, hang a t-shirt from the 2010 team, and wear the same hat I wore 2 years ago. I wore the same Giants shirt that Karen got me with the same undershirt as well. Nothing got washed, but it was taken off during non game times. Mat Latos was getting the start for the Reds in Game 5. If you don't know why every Giants fan hates him, google it, its a fun reason. Matt Cain was the obvious choice for the road team. Early on it was the same old from Latos and his days in San Diego. Nothing was working for the hitters. Cain was just as good on the other side. That, and Giants history, all changed in the top of the 5th inning. In the span of just a few minutes I went from white knuckle fan to jumping in the air. It started with a Blanco single then a Crawford triple. Latos seemed to calm down as he got Cain to ground out. The Giants had 2 runs in but he had 1 out and the bases empty. That will usually favor the pitcher. Cozart muffed a play and Pagan was on first. Scutaro walked, and right away Panda singled to LF to load the bases. The MVP stepped to the plate. Against one of the most hated pitchers, and against the old manager of the Giants, he delivered in dramatic fashion. Buster turned on a 2-2 pitch and drove it deep to Left. It hit the scoreboard for the 2nd deck with a thud and my house erupted. I screamed at the top of my lungs and hopped around like a little kid. Fact really is stranger than fiction. There was no way Matt Cain and the bullpen would blow a 6-0 lead. They didn't. Romo made it very interesting in the 9th by giving up a run and letting the tying runs on base. An epic 12 pitch battle with Jay Bruce ended with a fly ball, and them Rolen struck out to end it. The Giants had won Game 5, 6-4. I didn't care anymore about the final outcome of the year. That comeback was enough for me. I felt like every time the Giants won and forced another game, it was another day I got to spend with my dad. We both hated the Cardinals, so I was happy to see that they were next. But after that last series I knew I was lucky just to spend one more game with dad.